Evie the Extraordinary and Her Mommy: The Journey As We Go: Joining a new "family"
I remember watching a TV show many years ago where a woman bought a Saturn car and suddenly found herself as part of a happy community of Saturn owners. It was very cheesy, but the woman felt like she had found a new family. Just because she drove a Saturn. 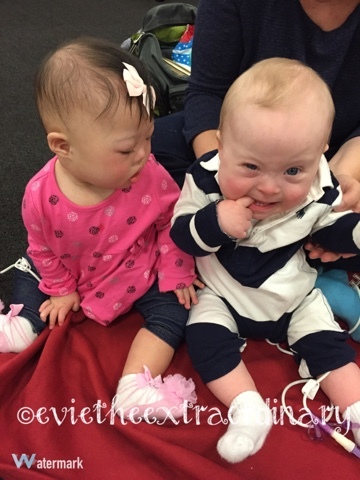 Evie and Mommy went to our first New Families Event by the Massachusetts Down Syndrome Congress in Burlington. 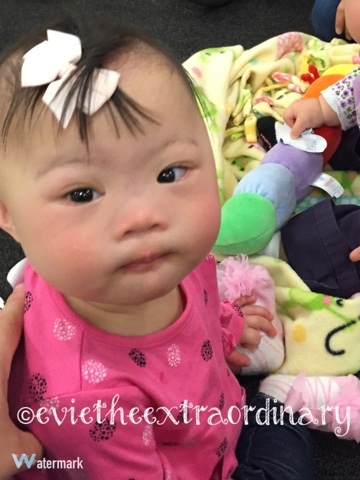 And kind of like joining the Saturn family, but MUCH more genuine and life-changing, I feel like because Evie has that extra chromosome, we have found a new family. This morning, Evie and I walked into a room full of the cutest babies/toddlers, their amazing siblings, their parents, and grandparents. I ordinarily don't love huge rooms of people I don't know, but I immediately felt at home. 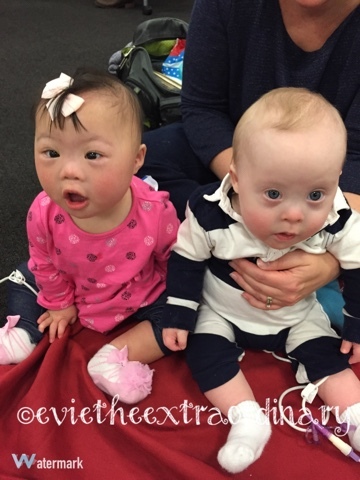 We all had a connection with Down Syndrome, and it was there in the room, but more importantly, we were just enjoying our kids and sharing our stories with one another. And even though all of the little ones had Down Syndrome, each one of them was so unique. Our friend JJ was Evie's tubie buddy--they G-tubed and J-tubed together during the party. They are the same age--only 2 weeks apart! We intend to take pics of them at each event when we see each other so we can laugh at how far they've come in 20 years.